It seems like not long ago, we raised our glasses to the sound of popping champagne corks to celebrate the beginning of a New Year. But just around the corner is another Chinese New Year – the year of the Dragon. 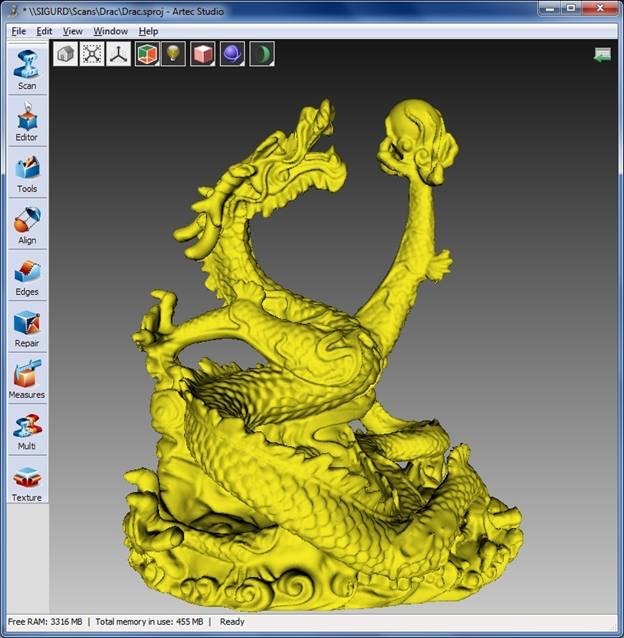 In honor of that, we have scanned a dragon statue, which made its way into the Viewshape 3D model gallery for iPhone. As with many things in life, New Year’s celebrations vary from place to place: while the Americas and Europe party on December 31st, our Asian friends retrieve their firecrackers around the end of January. The start of the Chinese New Year depends on the appearance of the new moon and will be celebrated on January 23rd this year. According to the Chinese horoscope, 2012 will be the year of the Dragon. 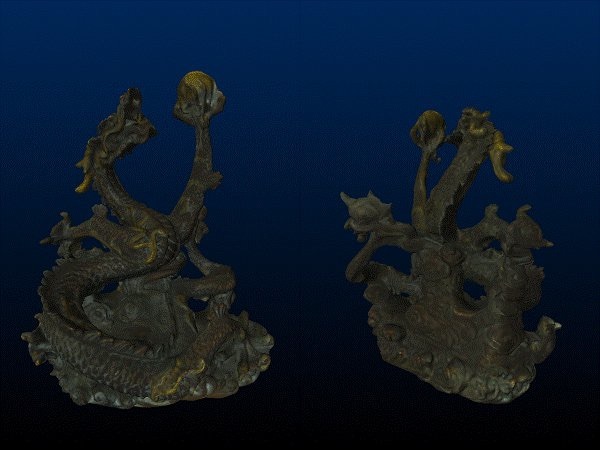 The dragon statue we scanned was about 25 cm tall and made of bronze. Holding a pearl, it represents power. Being of a twisted form with high detalization and generally dark material, this dragon is not an easy object to scan, though. To make sure we get a high quality model in color, we used two scanners – the Artec MHT and S scanner. First, we captured the model with texture using the MHT machine. Then we switched to the Artec S scanner to grasp all those tiny details. Scanning time was about 2.5 hours. Received scans were aligned in Artec Studio and all there was left to do was to apply texture onto the resulting model. You can download this model for your iPhone from Viewshape.com. Viewshape is our free 3D viewer available for Windows and iPhone. Want to learn more about how to combine two Artec scanners to increase detalization of your 3D model? Check out one of our latest success stories about scanning a luxurious fireplace here. A year under the Dragon promises to be full of drive and business opportunities. So go get your pyrotechnics from the basement and celebrate New Year’s again – this time Chinese style!